Julienne has been fighting for 25 years to walk free from the prison of illiteracy. She lives in Haiti, one of the poorest countries in the American continent with a literacy rate around 61%. In the past, Julienne was said to be slow to understand and unable to learn to read and write. Today, Julienne has moved from the status of an illiterate person to the status of a person who is able to write her name, read the Bible in Creole, check her daughters’ homework and sing Christian songs out of Christian song books. Julienne was born in Cap-Haitian. Her family consisted of her late mother, her father, three brothers and two sisters. Her sister, Déanise is her twin. While Déanise was successful at school, Julienne never found any joy in attending because she was slow to understand and she never managed to pass her classes. 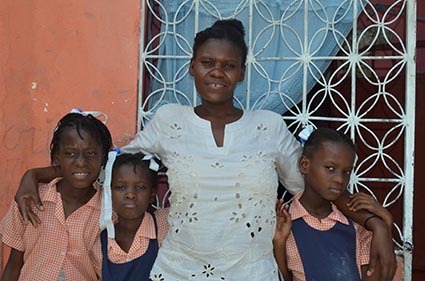 As she was growing up, Julienne thought that her life would only be as a failure as long as she was around her twin sister, so she resolved to go live with her aunt in Port-au-Prince when she was 17. 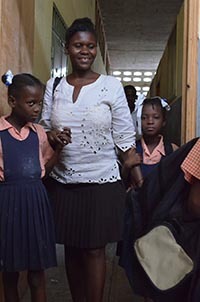 When Julienne arrived in Port-au-Prince she decided to go back to school where she was accepted into the fourth grade at an elementary school for adults. Being in school again was like a window of hope being opened for this teenage girl who believed that she would conquer her demons and finally do well at school. 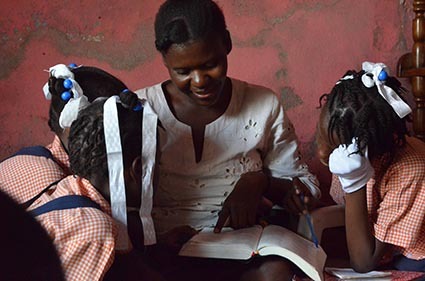 However, she soon realized through her class assignments and her constant inability to understand the lessons that things might not be different from what they were back in Cap-Haitian. One year later Julienne’s final results came out and, unfortunately, her grades looked similar to the previous ones she had when she lived in Cap-Haitian. 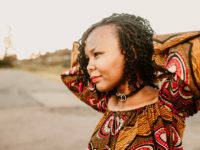 She was so downcast after those results that she decided to drop out of school and find an income generating activity that could help her move on with her life. Since Julienne didn’t have any skills, she went to work in a manufacturing plant. Things were not easy for her at the plant. Being able to read and write was becoming a must for Julienne since she needed to look for her name every day on the attendance list and write it down too. During the same period she started working at the plant, Julienne met a man named Ducanès and they started to live together. They eventually had three children, including twins Cynthia and Cynthiana. Julienne’s aunt was a member of the church Eglise Nouvelle Jerusalem de la Menojeh and when she was at a church service, she heard our Child Sponsorship Program was registering more children. She did what every caring relative would have done – passed on the good news to her niece, Julienne. Since Julienne used to visit the church, it was not difficult for her to go the child development center and find out if she was eligible for the program. When she reached the center, she followed all the instructions and submitted all the necessary documents. 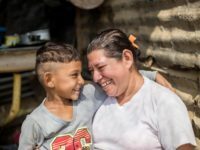 At the end of this process, Julienne was told that she had been accepted to be part of the program with Cynthia and Cynthiana. Right away, Julienne started to notice many changes in her and her daughters’ lives. 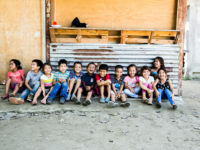 She noticed that her daughters were healthier and their development was far better than that of other children who are not enrolled in our program. Being part of our program has brought lots of significant changes in Julienne’s life also. She started attending church regularly and she surrendered her life to Jesus Christ. Soon after that, Julienne and Ducanès tied the knot as a newlywed couple. It seemed to be a “Year of Jubilee” for Julienne, not only because of her conversion to Christianity and her wedding but also because this was the year when Julienne finally managed to overcome the “demons” of illiteracy. “A majority of parents claim that they can read and write in the beginning. It is only through a written test that we find out if they are really able to read and write. “At the beginning of alpha course, I was reluctant to take part in that class because I was already 30 years old and I had three children to care for. In my own perspective I was done learning. Julienne doesn’t need to put a cross as her signature anymore. She doesn’t need to rely on her husband to check her daughters’ homework, she does it herself. She sings and she prays with her daughters and she is not ashamed to read the Bible with them anymore. Another page in Julienne’s story is being written – that is the story of a woman who has been fighting all her life to get some education and who is now able to read and write. And Julienne is not finished learning. Jean Elie Nicolas is a Field Communications Specialist for Compassion Haiti.